Paleo approved protein powders can be a great way to get extra protein while sticking to your diet. Below we'll go over what ingredients to look for an what to avoid. We'll also recommend a few great Paleo approved powders. There is a broad range of Paleo protein powders on the market. Finding the right Paleo protein powder can help you stick with healthy eating while maintaining a busy schedule. The wrong powder could be a source of weakness in your diet, keeping you from your health goals. This guide will present the benefits of a healthy Paleo protein powder, as well as five of the best powders on the market today. Who Should Use a Paleo Protein Powder? The Paleo diet emphasizes whole, not overly processed, foods. However, you might be surprised at the many types of people who rely on protein powders. Powders are perfect for individuals who follow the Paleo diet but are so busy that sticking to it is a challenge. Athletes also look to protein powders for an immediate and readily available protein source. Powders provide an easy, grab-and-go source of nutrition that can work as a meal replacement, or a snack that will help you make it to the next meal. Powders can be consumed as shakes, bars, or cookies, all of which are easy to take on the road. Athletes often turn to protein powders to help them recover from serious workouts. Fitness experts often recommend consuming protein within 10 minutes of a challenging workout, and mixing up a protein shake is a convenient way to do so. Packaged powders make it easy for athletes to ensure that they take in the ideal amount of protein for muscle repair. Those who stick to the Paleo diet agree that whole foods are best. Protein powders don’t give the body all of the fiber or nutrients that less processed, whole foods will deliver. But when you need a meal on-the-run or at the gym, a protein powder might be just right. What Are The Benefits Of Using A Paleo Protein Powder? What can Paleo protein powders do for your body and your health? Most importantly for Paleo beginners, they can help you stick to the Paleo routine. For those focused on weight loss, they can contribute to a healthy nutritional plan; when used as a meal replacement they can help you stick to a specific calorie count. They are convenient, require little prep time, and are extremely cost-effective. Also, some powders come with health benefits besides the supplemental protein. For example, some powders contain probiotics, which have been linked to weight loss. Many powders contain vitamins and minerals that are essential for proper body functioning. So, what makes a good protein powder? The Paleo diet is based around healthy foods that are minimally (or ideally not at all) processed. However, protein powders are, by the nature of the beast, a processed item. This makes it a little bit tricky to identify which powders are healthy and which are not. One of the first things to look for is ingredient transparency. The best powders do not leave you guessing about any aspect of the product. Ideally, the protein powder has few ingredients, so this step is easy. Also look for whether the powder contains the right amount of protein per serving, and is made with real food ingredients. The protein should come from eggs, beef, or a mix of fruits and vegetables. I find that the best protein powders also have additional supplements. When choosing a protein powder, it is important to look at the ingredients list so that you make sure that the manufacturer’s idea of “Paleo” matches with your definition. Just because it says Paleo on the front, does not mean that it is! For example, if you follow a strict Paleo protocol with no dairy than watch out for whey protein. Whey is a protein derived from cow’s milk so that it will conflict with your program. In addition to the items that are not strictly Paleo, you’ll also want to watch out for foods that are technically within limits but won’t contribute to a healthy meal. These include a high amount of starch or cholesterol or too much protein. Avoid beef protein that comes from cows given hormones and antibiotics. The final consideration to address is the fact that exercise and nutrition go hand in hand. Exercise experts find that the amount of protein and carbohydrates the body needs varies depending on how hard and how much you are training. Carbohydrate intake is especially crucial for endurance athletes who burn through high quantities of fuel with each workout. This means that when you choose a protein powder, you need to think about how hard you usually work out. People who perform endurance cardio workouts should choose a powder that has a significant amount of carbs, which will help their bodies fuel the exercise. For others, a high carb count could hinder weight loss. POWERED WITH REAL FOOD INGREDIENTS: Helps heal your body more quickly with whole food ingredients like flax, banana, blueberry and kale! BOOSTS YOUR IMMUNE SYSTEM: This protein powder boosts your immune system with powerful antioxidants and essential vitamins and nutrients to help you heal quickly. 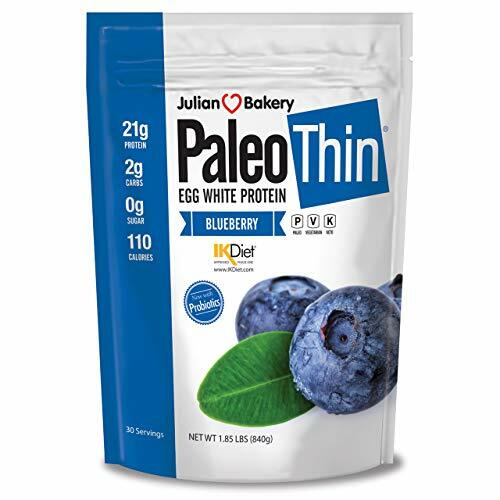 This protein powder is Paleo friendly and is gluten, dairy and egg free which is great for those with specific allergies. The protein source for this powder is beef, chicken, and salmon which is good because these sources are high in amino acids, vitamins, and minerals. The Perfect Paleo Powder also contains a prebiotic fiber blend which is beneficial to the body because it stimulates the production of good, helpful bacteria in the gut. It also contains flax, kale, blueberry, banana, and other ingredients to help it serve as a multivitamin. With a high-calorie count (approximately 1,000 calories per serving), this powder would make a great post-workout meal replacement but would be a poor choice for the less active with lower caloric intake needs. It does use palm sugar as a sweetener, which disqualifies it from some people’s individualized programs. However, palm sugar has a lower glycemic index than table sugar, honey, and even agave and is considered a healthy alternative sweetener. The product has a long list of ingredients, so people would want to read carefully so that they ensure they avoid their particular sensitivities. ONLY TWO INGREDIENTS: Egg white protein from eggs raised on US farms and sunflower lecithin. Naked Egg contains no artificial sweeteners, flavors, or colors. PRODUCED ON US FARMS: Our powdered egg whites are sourced exclusively from US farms and are processed in under a day to maintain the highest and most complete amino acid profile. MAXIMUM NUTRITION: 25g of Protein, 2g of Carbs, 110 Calories, and 5.8g of BCAAs (branched-chain amino acids) per serving. 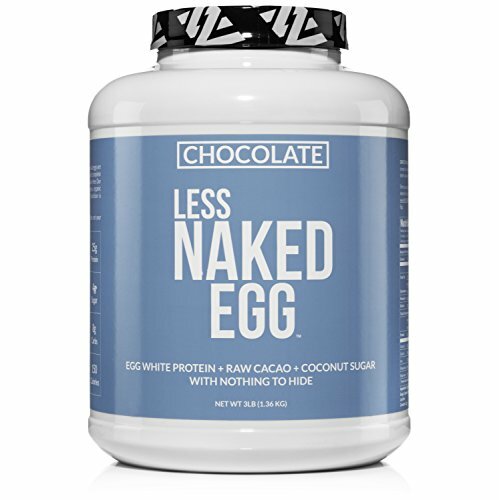 The Naked Egg protein powder has an amazingly short list of ingredients, which makes it highly transparent. The only two foods in this powder are eggs that have been raised on US farms, and sunflower lecithin. Because of the simple ingredient list, you can imagine that the powder has little taste. It is not made to be mixed with water and consumed. Instead, it is ideal for adding to smoothies for a protein boost or used in baking projects to create protein-packed snacks. Because the protein comes from egg whites that have been processed within a day, the amino acids in this mix are high quality. Egg whites are an extremely lean source of protein, which means that they provide a high protein to calorie ratio. With each serving of this powder you would get 25 grams of protein, yet only consume 110 calories. Since this powder is best mixed with other ingredients, more calories will likely be added onto that to take in the protein. This powder comes in a fun double chocolate flavor, which makes it great for baking yet has an amazing 0 grams of sugar per serving. This is because the sweet, chocolate flavor is coming from a blend of organic Stevia leaf, cocoa powder, and chocolate and vanilla extracts. The protein in this powder comes from grass-fed, pasteurized beef. It has 25 grams of protein per serving and only 108 calories per serving. This is a plus for anyone looking for protein without taking in a high amount of calories, for weight loss purposes. The vitamin and mineral profile of this powder is very minimal. It has a small amount of vitamin A and C, and no iron, calcium, or other minerals. When it is combined with other ingredients, such as berries in a protein smoothie, this could provide the protein and chocolaty flavor that you are looking for. But on its own, it is not a good source of vitamins. The Paleo diet philosophy emphasizes the benefits of eating whole foods that have been minimally processed. With that said, sometimes a protein powder is the best option for meeting your nutritional needs, even when on the paleo diet. When you don’t have time to grill a piece of chicken and veggies, it is far better to grab a protein smoothie on the go than to resort to stopping into a quickie mart for a donut or slice of pizza. The Paleo dieter looks to protein powders to keep them on track with their program while they lead an active life. To pick the best protein powder we have to balance the convenience of it verses the ingredients list and health benefits. The reviews covered here showed that each powder has strengths and weaknesses. 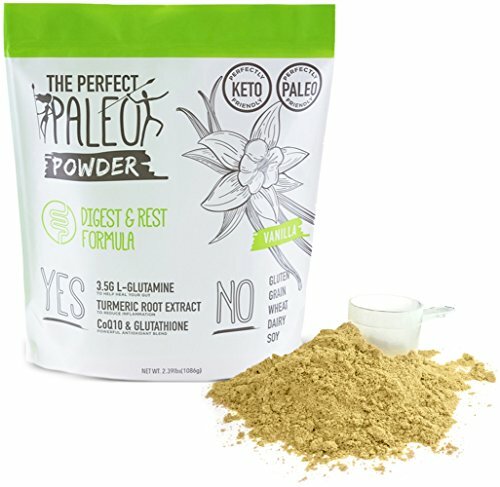 For the Paleo dieter who needs an occasional on the go meal or post-workout protein punch, the PaleoPro powder is the clear winner. It can be consumed conveniently (no need to put it into a smoothie or baked goods), and it has a simple ingredients list. When on the Paleo diet, the vast majority of your foods come from whole processed foods. You most likely aren’t looking for fiber, multivitamins, omega-threes, or minerals in your meal replacement, because you meet those needs in other meals. However, you do need a quick, clean source of protein, and the PaleoPro mix delivers that from a mix of beef and eggs. This mix is best for people who need a convenient protein source on the go, to supplement their otherwise unprocessed meals.